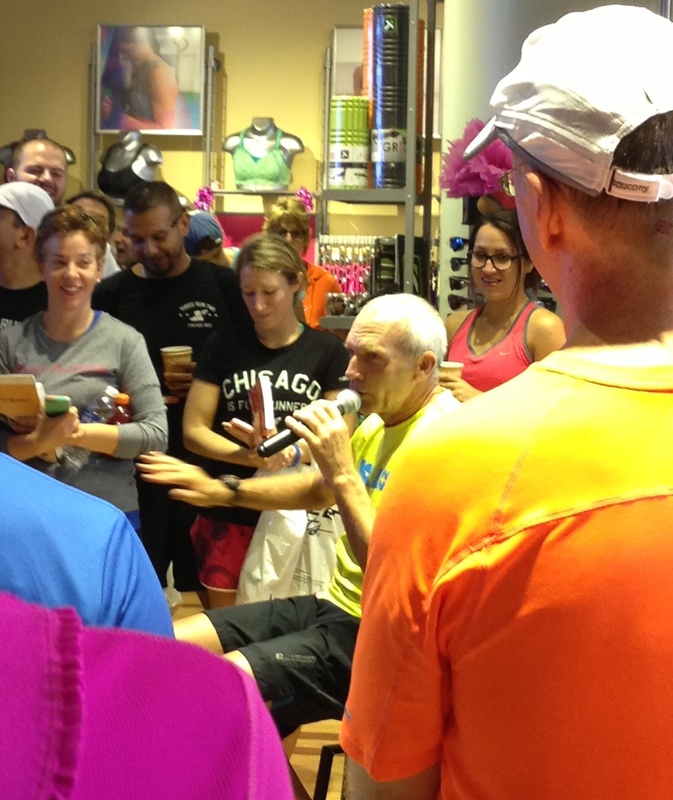 The night before the Chicago Marathon, I had multiple nightmares. There was of course the “I have a calculus final and I don’t know calculus” one that I have at least once a week. The interviewer asked me if I had achieved my goal, and suddenly my boss from Rogue was standing there gjving me the “you better not eff this up” glare, and I was trying to sneak a look at my Garmin to see where I had finished. I woke up from this last one literally in a cold sweat. Which, BTW, is disgustingly uncomfortable. I then lay awake for an hour pondering whether this dream was a good sign or a bad sign. Did dreaming that I would finish in 4:21 mean the marathon gods intended for me to succeed? Or if I DID finish in 4:21, would that mean I was somehow psychic and would always finish in the time I dreamed of the night before?? What if I dreamed an 85-minute 5K?!? Needless to say, if a marathon can make a normal person anxious, it can make an already anxious person nearly have a breakdown. 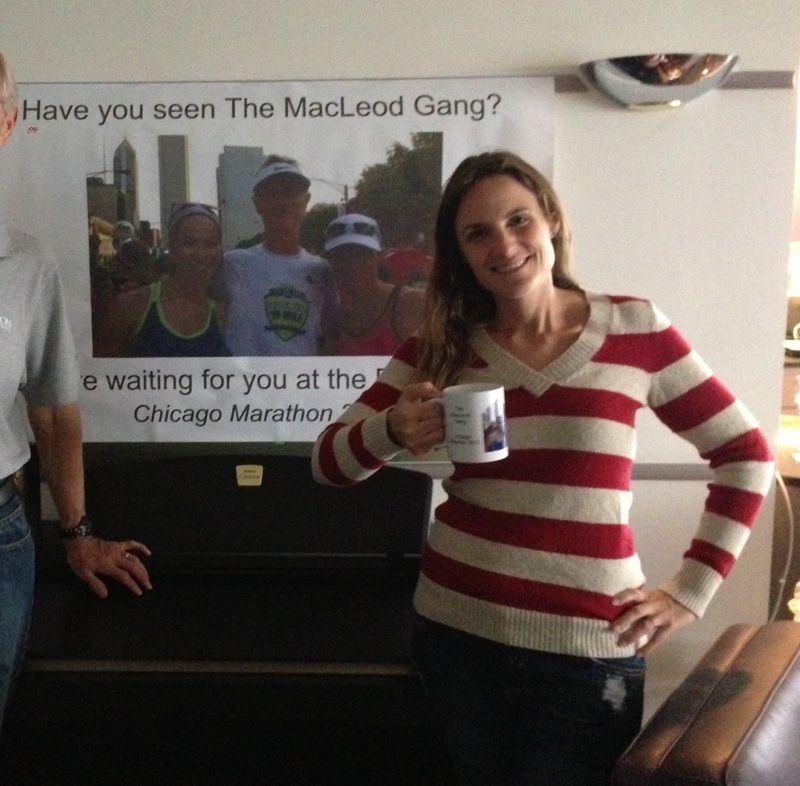 We arrived early Friday to find that my Evil Stepmother, as she prefers to be called, had once again printed out a banner, pens, and coffee mugs emblazoned with Team MacLeod pictures. I got 99 problems and vanity is definitely one. Dad and I headed out almost immediately to meet my cousin at the expo, which as usual was a highlight of the race experience. Everyone’s in a good mood at the expo, because no one has had their race go to crap yet, and I’ve never seen a bigger one than Chicago! 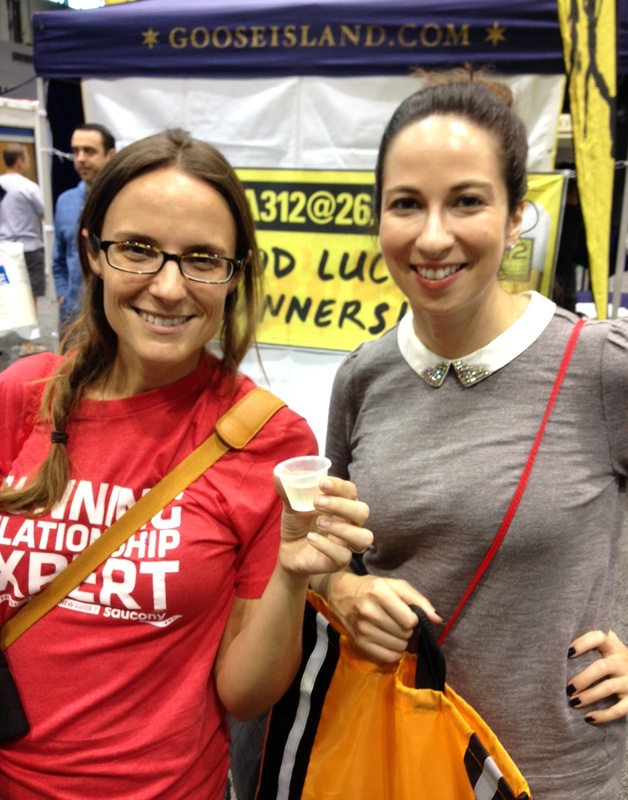 The three of us made like college kids and had a little competition over who could collect the most free food samples. This worked well until we all got simultaneously derailed by free wine samples, which I’d never seen at a race before but really…BRILLIANCE! Did I mention we got free wine? In reality, the store was farther away than I thought, I ran almost 2.5 miles just to get there (plus the 2 for the actual run, plus another .5 to make it back to our Chicago Architecture Tour on time…5 mile shakeout, oops), missed the welcome entirely, and talked to maybe three people – one of whom kindly asked me if I was looking for the Couch to 5K group. Humph. On the plus side, we did get an entertaining speech from Bart Yasso and free bagels. Pic of Bart Yasso from that creepy, back of the room angle. I also achieved my “business goal” of surreptitiously photographing the store to see if we could glean any merchandising tips from them. 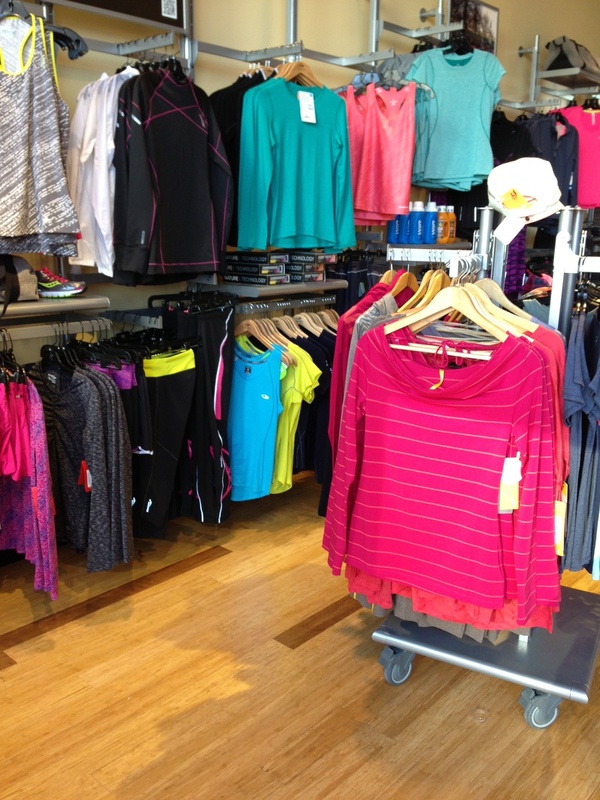 Alas, turns out they also have far more product than racks, leading to the 4-5 “cute outfits” near the front and everything else jumbled together wherever it will fit. I WAS Freudianly (that’s a word, right?) happy to watch the same girl rehang socks three times. I think sock manufacturers have formed a union with the sole purpose of making flimsy packaging that must be balanced like a basketball on your pinky to avoid littering the floor with expensive, wicking, non-blister-causing fabric. I didn’t have any wine at dinner. You go to dinner with my family and try to accomplish such a feat. Not so easy now, is it? I also poked myself three times in the endeavour. And if you’re wondering, yes, it did occur to me that I could take this opportunity for some “exposure” to running with a crooked number, but a marathon PR is more important than acting like a normal person. Obviously. Having recently read a blog post about how boring minute-by-minute race reports are, I’ll try to keep myself to just the highlights here. It was cold. And crowded. Welcome to Chicago. Also, the mic kept cutting out during the national anthem, so all 45,000 runners carried the song whenever the singer’s voice disappeared. I’m not usually very patriotic, but it was a pretty amazing experience – one of those that gives you the warm fuzzies about the running community. One bummer: Now that we’re in the post-Boston era of major marathons, there were lots of “enhanced security measures”, which included not allowing spectators up on the downtown bridges. It was both weird and sad to run down into the Columbus tunnel without screaming fans and cowbells counteracting the meeping of confused GPS watches. First spotting of Handsome J and his parents. THEY had a cowbell. Try not to tear up waving at the seniors lining the windows of their assisted living facility. Umm, you’re not funny; you’re just an a-hole. I also tried to convince myself I was running down a hill, even though I know the course is pancake flat unless you’re going over a bridge. Get bored with panicking and continue on. Whew. Miss the Gatorade table at the aid station, thus throwing off my rhythm of alternating Gatorade and water at each stop. Try to convince myself this is not life-ending. Slip on a banana peel. Decide I’m feeling physically good – and mentally tired of doing math at every mile marker – so I’m going to stop obsessively checking Garmin and just push the rest of the way. Note that I hit the mile marker at 4:09. Begin panicked sprint in fear of fulfilling my 4:21 dream prophecy. Give serious thought to throwing an elbow at people walking three abreast up Roosevelt hill. Settle for yelling, “Excuse me!” in a rude tone of voice. Watch reads 4:20.30. Official time was 4:20.32. 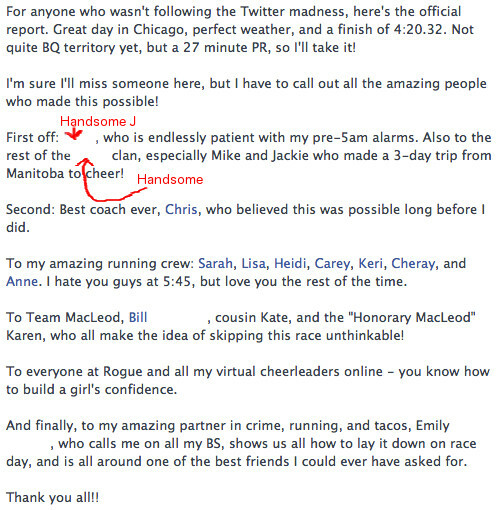 In complete disbelief at PR! Try not to vomit when someone offers me more Gatorade. I’ve had a gallon already, thank you. Handsome J asks where he’s heard the number 4:20 before. Realize I have a pot PR. Because you can’t say it better than you did on race day. Please excuse my sad attempts at privacy protection. Congrats again! And thanks for all the coaching, even when you clarify the wrong ways to do things. Wine before a race has to be beneficial somehow, if only to calm nerves. After this year, I’m definitely hooked and luckily have lots of room for improvement. So looking forward to next year already- though I’m still not really walking well. Team MacLeod! This entry was posted on October 15, 2013 by RunFiestaGal in Chicago, marathon, PR, races, travel and tagged Chicago, marathon, PR, races, travel.